Connected Principals – Sharing. Learning. Leading. Read More What do you do with what you know? Earlier this week, I was speaking at What Great Educators Do Differently in Houston. It was a fantastic event with a great lineup of inspiring education leaders. My topic was Great Educators are Risk-Takers and Difference-Makers! When I have the opportunity to work with school districts or speak at conferences, I want to remind educators that we’re educating kids for the world they’ll live in and not the world we grew up in. It’s an central message in my book, Future Driven. The world is changing faster than ever and schools need to be changing too. I always ask, “Is your school a time capsule (static) or a time machine (dynamic)?” We can’t afford to teach to a test or simply prepare kids for the next grade level, or even college or career. We’re preparing them for life and anything they might face. 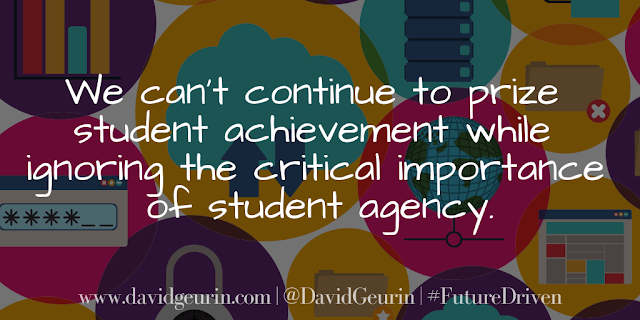 We can’t continue to prize student achievement while ignoring the critical importance of student agency. Kids need more opportunities to make decisions and take initiative. We need to develop future leaders and passionate learners, not just proficient test takers. And the only way that will happen is by allowing teachers to have the needed professional autonomy to be risk-takers and difference-makers. Educators must have the freedom to take initiative and make decisions. They need the flexibility to use their strengths and bring their passions into their classrooms. But I also want to challenge educators. What are you doing with the autonomy you have? Are you pushing limits? Are you challenging the status quo? Are you creating extraordinary learning opportunities that prepare students for a complex, unpredictable world? If we’re going to crush student apathy, we have to start with addressing teacher apathy. We have to show up strong! What other future driven questions do you think are relevant for educators to discuss? It’s amazing how questions can help us make the best decisions. I want to hear from you. Leave a comment below or respond on Facebook or Twitter. What Would Happen If You Weren’t Successful On This Thing?